I think it's very interesting how some vintage Hamilton watches make their way to distant lands. It's not surprising, of course, but it does make you wonder how they got there. For example, I recently purchased a watch that came all the way home from England. It is a 1938 Gilman - and I wonder how long it was expatriated? Did it go over there for WWII? Did a UK collector buy it from someone in the US in 2008? Who knows? Anyway - the Gilman was introduced in 1938 and produced through 1946, excluding a slight hiatus while production was dedicated to the war effort. The Gilman sort of reminds me of a solid gold version of the gold filled 1938 Dickens. The Dickens is a bit longer and more curved to fit the wrist though. The Gilman came in a 14K solid gold case with only an applied gold numeral dial. So it's a pretty straightforward model. Tucked inside you will find a 19 jewel 982 movement in the 1938 and 1939 model. 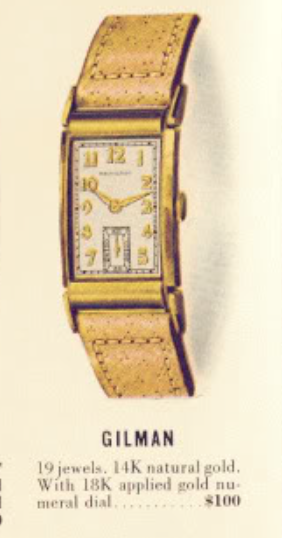 In 1940 and later, the Gilman received the 19 jewel 982M medallion movement. My Gilman project watch caught my eye mainly because it was in serious need of some love. Fortunately the interest from other collectors must have ceased at the melt price of the gold - as I was able to land it for a very reasonable cost, just above scrap. As received, it was really beat up and filthy. This watch had definitely seen a lot of use but it was still running. The corner of the bezel has a hole worn clear through to the inside. Hopefully my local jeweler will be able to fill that for me. The back of the watch is so dirty that I really can't read the engraving on the back very easily. It has a nice presentation though - and that caught my interest too. This watch was obviously very special to the recipient. With the crystal out of the way, you can see that the original dial shows it's age. Some folks like this original patina'd look. Me, I'd rather see a nicely refinished dial once an original looks like this. Dials like this can be redone to look like new and getting dials like this refinished was often a part of the general overhaul service, back in the day. The 982 movement is in decent enough shape to run but can still stand to be cleaned and oiled. The serial number dates to 1938, just as you'd expect, based on the engraving on the cace back. The movement is completely disassembled, cleaned and then set out to dry before being put back together with fresh lubricants. A little tweaking to the regulator brings the beat rate right in line. I tend to leave watches running just a smidge fast. The beat error of 3.3 is on the high end of acceptable. I could probably reduce it but that's tempting fate with old balances like this. A new crystal and a vintage Gemex strap almost complete the restoration. Now that the watch is running great, I'll send the dial out to be refinished and I'll take the bezel to my local jeweler to fill in the wear hole. I'll post an update when I get it all back together. With all the dirt and funk removed, you can now read the engraving. This was a very nice keepsake for Mr. Drinkwater from his friends... where ever he may be now. A little googling of James D. S. Drinkwater revealed a couple of patents for construction equipment on behalf of Link Belt Corporation. Maybe he received this watch for his 1938 Trough Washer Patent. Well, I got the case repaired and the dial refinished. I think it turned out great. If you look closely you case see where the jeweler filled the hole but it's way better and sealed off from anything getting inside the case. The best part is that I was able to save this interesting watch from being melted down for the gold! Have you looked up Mr Drinkwater at www.FindAgrave.com site?? I can read minds but only from about three feet away. : ). So you'd need to send me a photo of the watch or compare it to the above to confirm it's a Gilman. You can contact me through Etsy.